Our scanning is done in-house, so the intuitive operation and uncomplicated maintenance of the InoTec units were strong differentiators. From high-volumes of records to occasional scanning, The Crowley Company has partnered with respected name brands InoTec and Avision to provide a perfect complement of high-production, daily use and low-volume document scanners. These compact scanners offer high speeds of up to 90 pages per minute, with all imaging performed at a high level of quality to consistently capture detail. And these solutions are intuitive and easy to use, too. If you’re looking for a document scanning solution, you’re in the right place. Whatever your context, we’ve got a document scanner to get the job done. Avision offers a wide range of high-speed document scanners for on-demand or batch scanning, designed to fit a variety of size, speed and price requirements. Reduce clutter with compact desktop personal or workgroup scanners and enhance office efficiency with departmental and network document scanning systems. These systems are dependable and versatile enough to meet a large breadth of scanning needs. 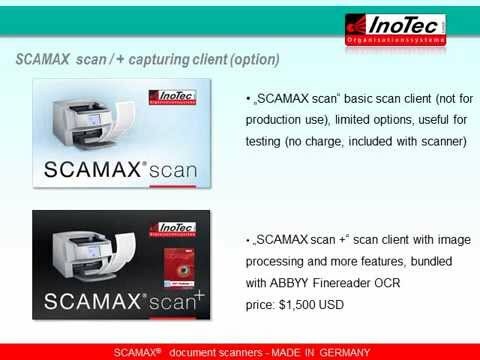 InoTec high-volume document scanners are ideal for any organization with a large amount of paper or other flat records that seek to enhance workflow, reduce consumable and repair expenses and operate environment-friendly scanners. The SCAMAX range of scanners are ISIS, TWAIN and Kofax VRS-compatible and have a low total cost of ownership (TCO) due to the glassless paper transport system which requires no maintenance, cleaning or replacements. If you’re looking for a cost-affordable document scanner equipped for high-volume, InoTec is a premier option. Want more information? For help in identifying the document scanner that best suits your needs, get in touch with us.